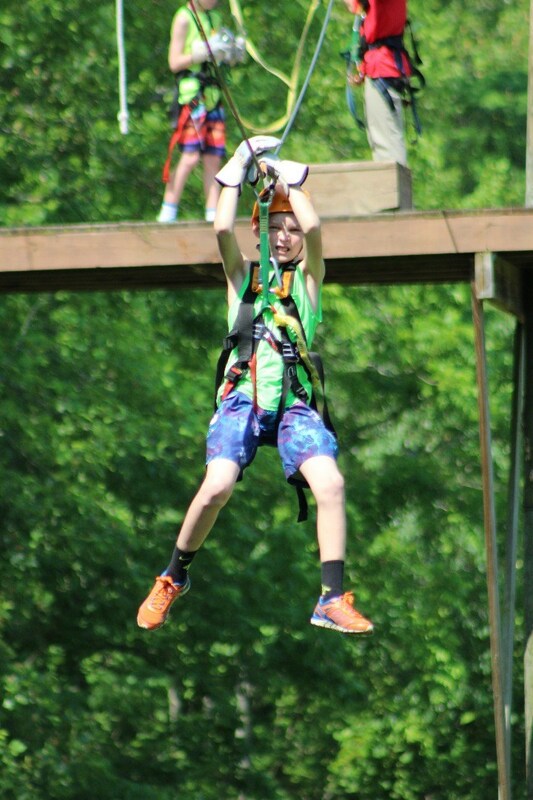 Experience a treetop soar and glide experience with the largest canopy tour company in the southeast! 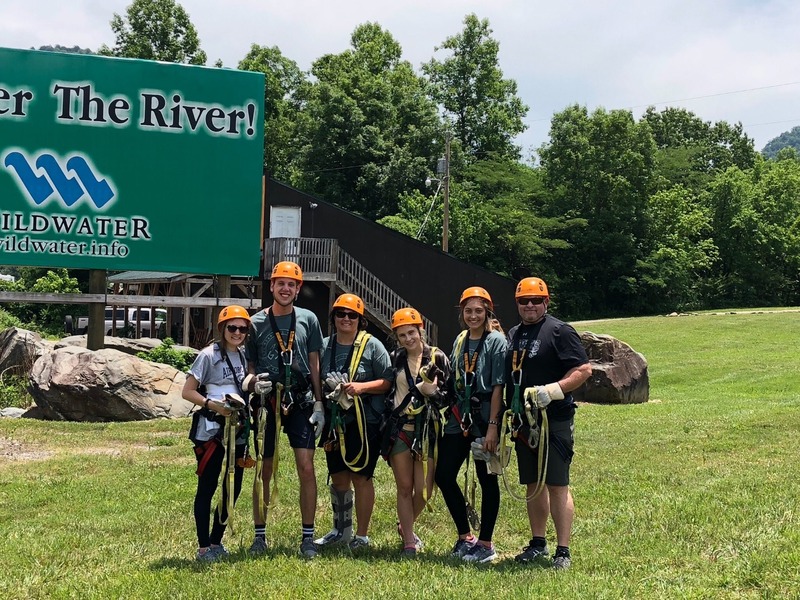 Enjoy a ziplining adventure naturally fueled by a gradual elevation change in the Smoky Mountains! 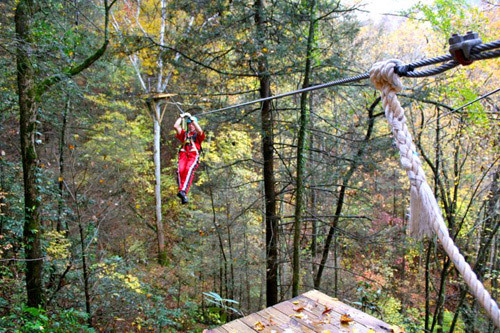 It includes zips that fly you beside, above and across the Pigeon River – at heights of 120 feet! For the best value combine your ziplining with rafting, jeep tours and lunch – all in one location! Must be at least 10 years old and weigh between 70 and 250 lbs. Tour lasts up to 3 1/2 hours. Smaller groups may complete the tour in less time. 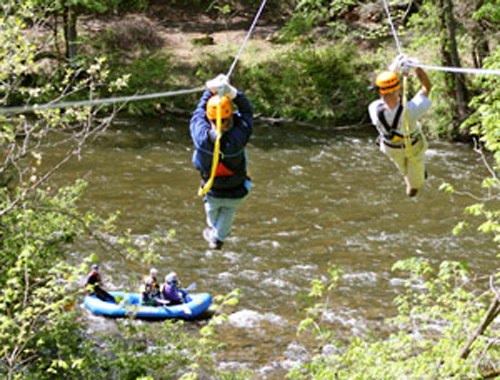 The only zipline canopy tour that crosses over the Pigeon River. 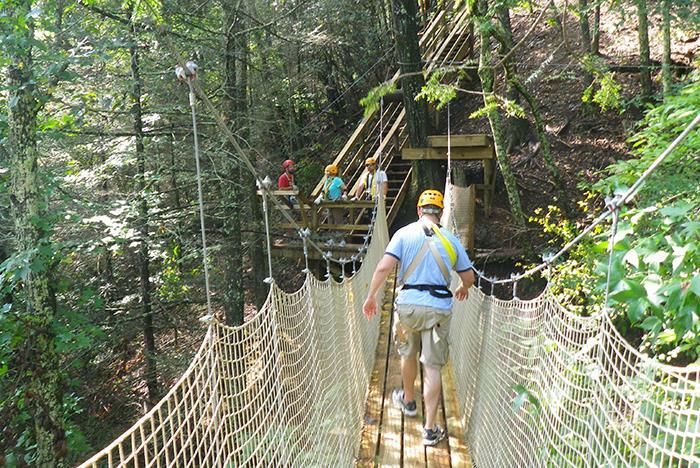 12 zipline sections between elevated platforms & treetop decks. The “Cliff Hanger” platform is perched on a 100’ rock cliff. 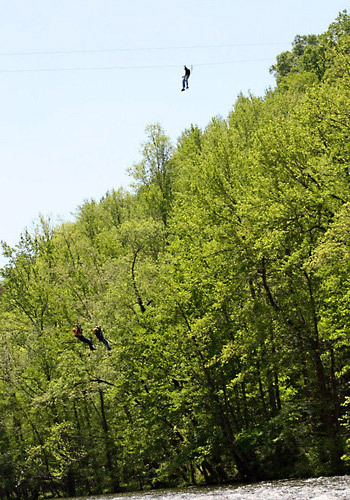 2 Pigeon River crossings including the Highline, a 1300' long & 120' high final zip. Over 15 scenic and historic acres of flying area. 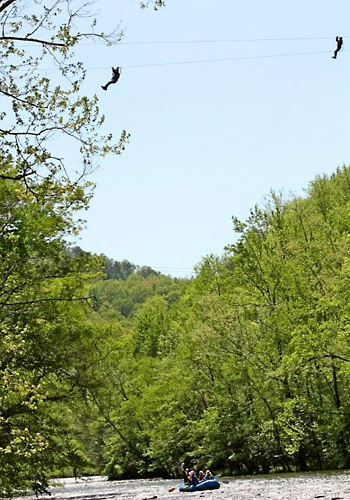 The ONLY zipline canopy tour in the Gatlinburg area that is truly in the wilderness with 2 spectacular zips across the Big Pigeon River! River crossings, rock cliffs, waterfalls, Rabbit Hole repel, sky bridges, wildlife and more are the things that make the Pigeon River Canopy Tour a once in a lifetime trip. 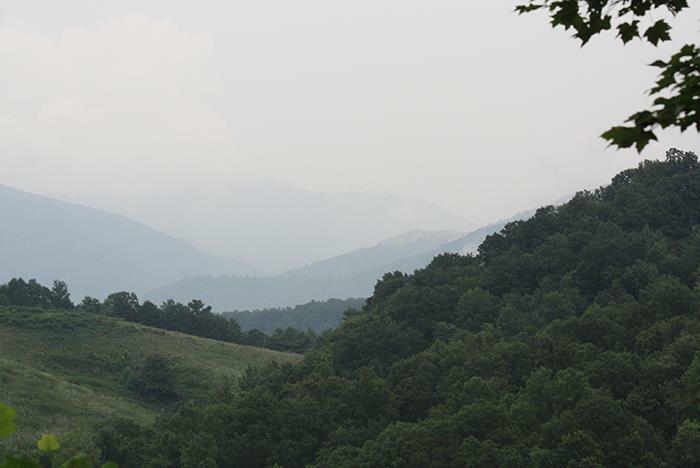 Enjoy a soaring and gliding experience naturally fueled by a gradual elevation change in the Smoky Mountains of Tennessee. Two different tours available. 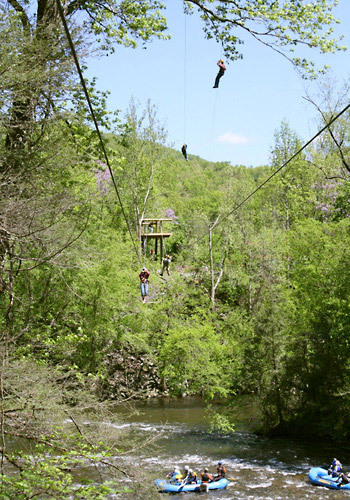 For those with limited time or budget the Pigeon River Ziplines Tour offers two hours of fun including the river crossings. 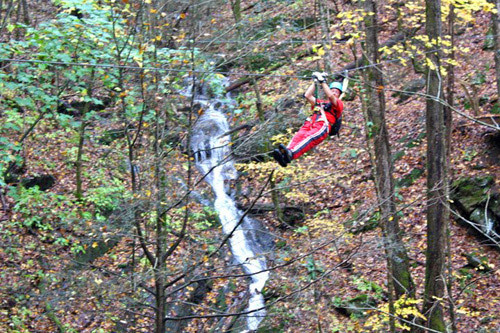 The Waterfall Gorge Canopy Tour includes 12 zipline sections, 4 sky bridges and both river crossings. 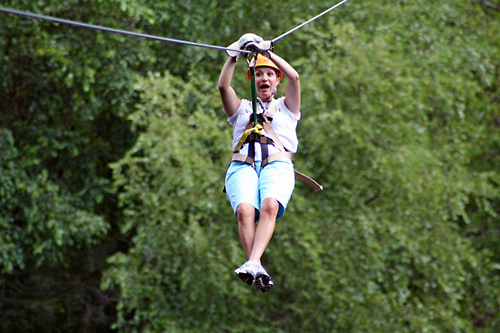 Both tours include our highest and longest zipline, 1400 feet across the Pigeon River. Participants must wear closed-toed shoes, be at least 10 years old, and weigh between 70 and 250 lbs. Numerous stair climbs are required and can be strenuous. Tours run rain or shine. 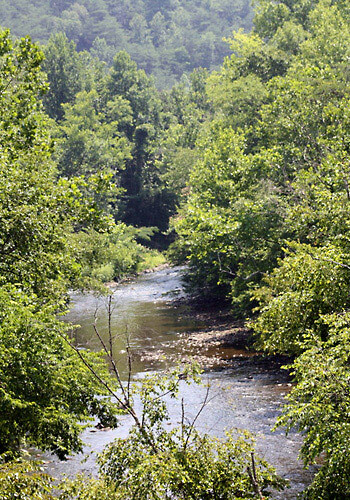 For a full day adventure add a Pigeon River whitewater rafting trip or Jeep Tour & lunch at the Dog House! 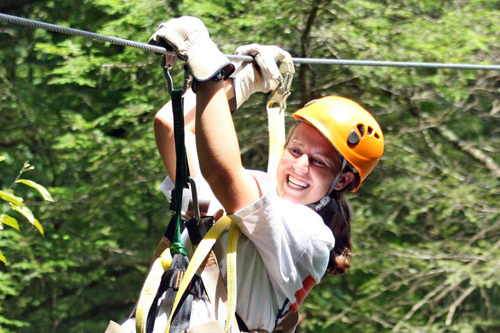 Canopy Tours are guided experiences using ziplines and bridges to travel through the trees. Natural interpretation, a sensation of flying, gaining a new perspective on trees and terrain, thrilling personal challenge and group interaction are all part of a canopy tour. Rangers lead groups of 8 to 10 people on an aerial trek while providing instruction, giving assistance and sharing stories, taking time to enjoy new vistas. 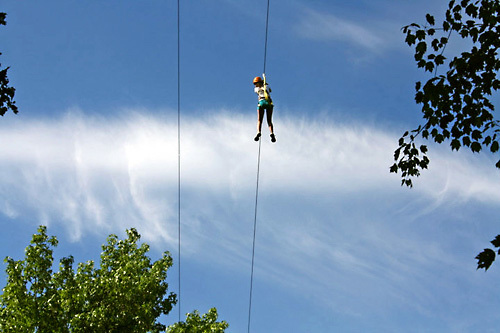 What is the difference between Canopy Tour and a Zipline? Canopy Tours are designed in the trees and around nature for adventure, education, beauty and for participant involvement. 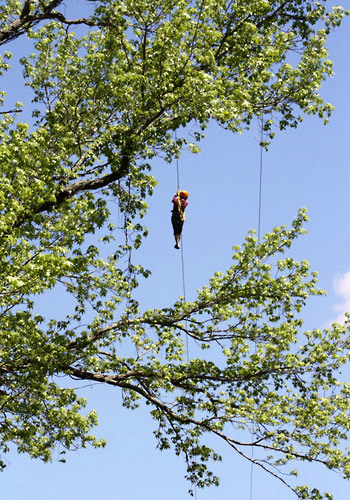 There will most often be between 10 and 17 elements including ziplines, tree platforms, bridges, stairs and sometimes rappels woven together into a complete experience in a special environment. 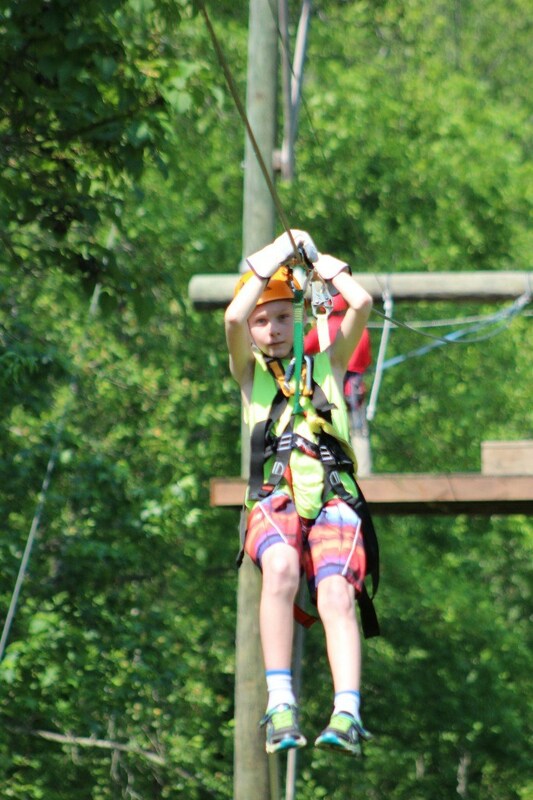 Ziplines are often shorter “thrill rides” with fewer elements, less learning, less participant involvement and often traverse open fields with little sun protection and sometimes simply cross over parking lots. 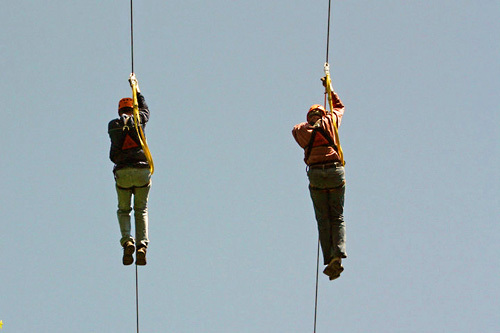 Canopy Tours are designed with safety in mind. Certified builders, engineering and regular inspections are a part of all our courses. ACCT standards are used in construction, inspections and training of staff. When participating in any adventure sport is up to you to listen, learn and follow instruction. Your participation in your own safety is critical to your well being. Arial activities like most outdoor adventures are safest when you stay alert, follow instruction and enjoy the experience. Wildwater Ltd. has been in business for 30 years and has maintained an excellent safety record. Our Team Members go through extensive training before being "checked out" as a trained guide. All of our guides are trained in CPR and First Aid with many being trained in Advanced Wilderness First Aid as well. Wildwater takes pride in providing our guests with a quality trip that is both safe and enjoyable on the river. However, due to the nature of whitewater rafting and other associated activities, Wildwater Ltd. and its affiliates assume no responsibility for personal safety or loss of personal property. All participants are required to complete a personal liability and photo release form before their trip. Join the crowd; most of us are afraid of heights and that is part of what makes Canopy Tours fun, exciting and challenging. We will start with basic instruction and practice before tackling any of the big stuff. Many rafters cannot swim but you should be comfortable in water. On all trips, Coast Guard-approved life jackets are provided and must be worn. On advanced trips it is recommended that you have basic swimming skills. In general you should be comfortable in water and all rafters should be able to follow directions. No, as long as you are less than 250 pounds, you are good to go. On most courses there will be stairs and or hills to climb, you must evaluate your own ability to climb stairs and walk on uneven terrain. 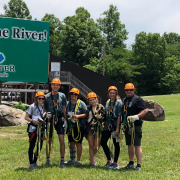 On the Pigeon River Canopy Tour their is a very long set of stairs called the Stairway to Heaven, the climb is long but the final zipline payoff is huge. 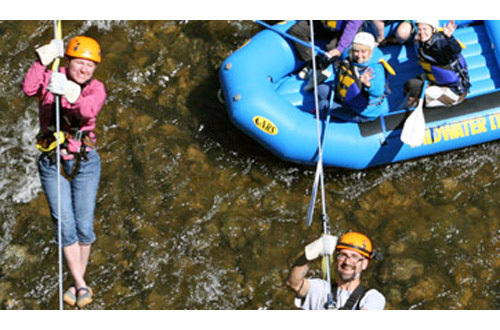 For rafting, Participation is required on all of Wildwater Ltd.'s trips - you must paddle. You do not need to be an athlete, however a good physical condition is recommended. Life jacket limitations are a maximum girth of 52". For any medical conditions that may be affected by strenuous activity please consult your doctor. IF YOU ARE PREGNANT, YOU WILL NOT BE ALLOWED TO PARTICIPATE! 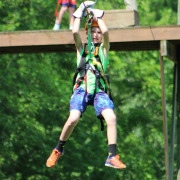 You will be outside for a couple hours with the ziplining. Dress appropriately for the expected weather. Personal safety harnesses will have straps that go around your upper thighs, so longer shorts are advisable. Straps over the shoulders are more comfortable if you have a collared shirt. Ball caps are not permitted since they restrict vision and make for a poor helmet fit. Beanies in cold weather are appropriate, fit under helmets well and will help keep you warm. Sunglasses or any glasses with a strap are fine. Jewelry should generally be removed and left in your locked car. Empty your pockets for a better harness fit and for comfort. Long hair should be pulled back and restrained. For rafting in the summer, shorts and a bathing suit and shoes that will stay on your feet are recommended. For the spring and the fall we recommend layering with synthetics such as fleece or polypropylene. We go rain or shine. Dress appropriately for the expected weather. In the case of high winds or lightning we will delay, cancel or cut a trip short. If the water levels on any of the rivers exceeds safe levels, trips may be cancelled or relocated to another river. What factors determine the age/weight requirements? Do to the nature of following instruction, predicting behavior and general height issues we require all participants be 10 years or older. Weight has a large impact on traveling speeds; lighter people will travel slower and may not make it to the end, larger people will travel faster and have to brake more while zipping. Harnesses and cables are rated for large weights but traveling speed and control can be a big issue for heavier people. 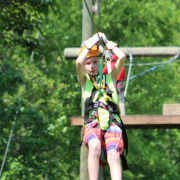 Ages 10 or older for Canopy Tours; Weight must be between 70 and 250 pounds for Canopy Tours. With rafting, does the child have enough size or body fat to have control of their body in icy water? Can the child rescue themselves or will the parents be so concerned about a young child they put their own health at risk? The determining factors usually revolve around the likelihood of a flip or swim and at what age a child listens to and understands instructions.